Our Fixed Mobile Integration solutions empower users with a single phone number and a single voice mailbox while providing them with access to the business communications features they need, anywhere and at anytime. Take advantage of our mobile services and you can enjoy a single bill for both fixed and mobile calls. 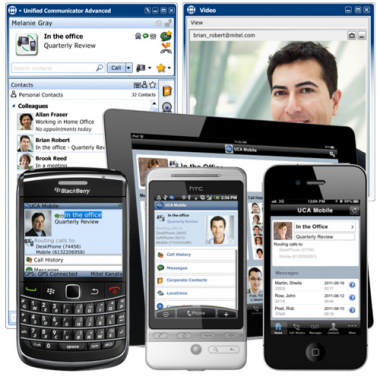 With our Mitel Unified Communicator Mobile (UCM) service, you can twin your extension with your mobile device, your home phone or just about any other telephone number. An incoming call will simultaneously ring both your extension and the twinned device. The device that you use to answer the call establishes a voice path and the other device will cease to ring. UCM extends a range of common phone system features to the selected twinned device and provides a truly integrated mobile and desktop experience by enabling seamlessly switching communications from one device to another. We offer similar services and functionality for our hosted telephony services too, so whether your office communications are on premises or cloud-based, we can help you mobilise your business.